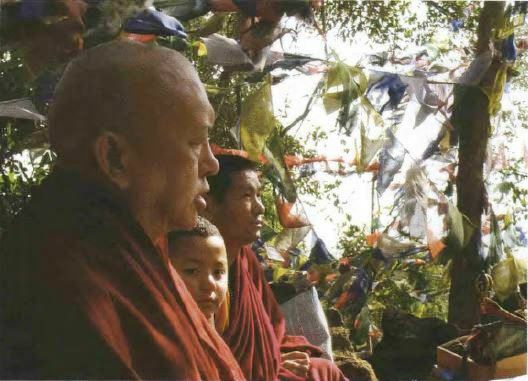 Three days after Losar 2008 Lama Zopa Rinpoche flew from Kathmandu by helicopter to the cave area of Maratika. Rinpoche was accompanied by Kopan monks Ven. Jinpa and Ven. Kunkyen. I was one of two Western students who went along. The other was Rik van Keulen. Five days were spent at this holy site, situated in the mid-hills of Nepal in a remote farming area, with no electricity and where goods are carried in by mule trains. There are a number of caves in the area but the main cave of pilgrimage is the Maratika Treasury Cave. It is here that Guru Rinpoche, with his consort Mandarava, achieved immortal life through the practice of Amitayus. The caves of Maratika are mentioned in Tibetan literature from the twelfth century onwards. A biography of Guru Rinpoche, discovered by Nyangrel Nyima Ozer, describes why the Maratika caves are a sacred place for Buddhists. Other written sources say that at the request of the Bodhisattva Avalokiteshvara, Buddha Amitabha taught the eighteen tantras of Long Life. The dakinis wrote them down in their symbolic script using melted lapis lazuli on golden paper, and deposited them in a box made of five precious jewels, which they concealed in the secret Maratika cave. There are said to be many treasures buried in this holy place.